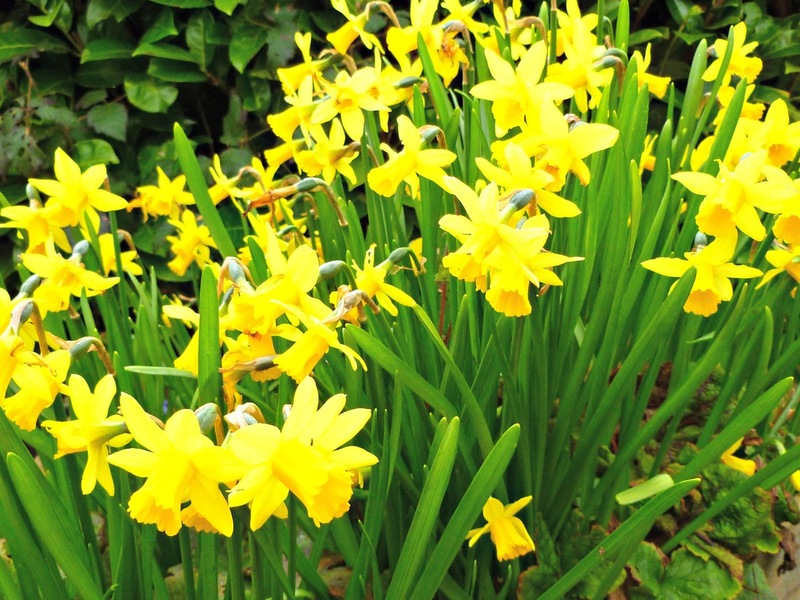 Here in the UK, those of the Christian faith have been celebrating Easter this weekend. It's a busy time in the church calendar and for those who are not church-goers, it's a lovely long weekend with many shops and offices closing from Good Friday to Easter Monday. It's also the time when traditionally far too much chocolate is consumed, and things were no different in our house! Our girls were finishing school for the weekend on Thursday (big daughter finished for two weeks as her holidays start before small daughter's) and my husband and I took the opportunity to escape for the day and headed to our favourite part of Wales with the dog for what turned out to be a rather blustery walk. 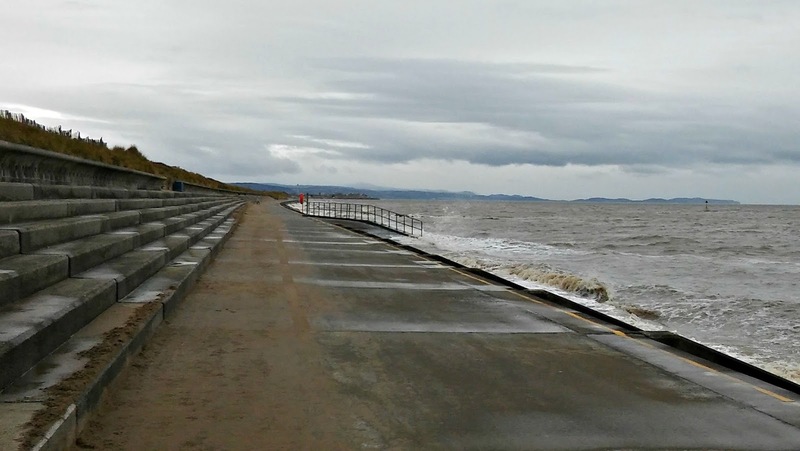 We're slowly learning that being self-employed means that we can work any day of the week that suits us, so if we want to take a day out to walk by the beach and do our work later, we can do! The place was pretty much deserted as anyone with any sense was safely indoors, but we zipped up our coats and set off anyway. 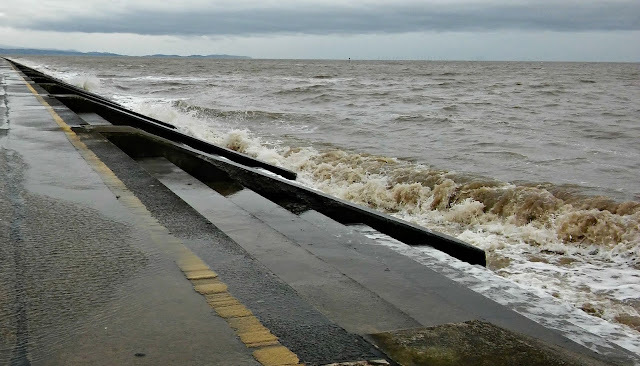 The tide was right in and the dog was keen to dance in the waves, but we kept him firmly on his lead - these were not the sort of waves for paddling in! 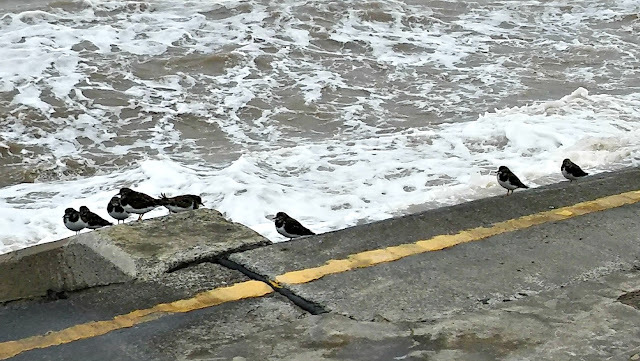 Even these little seabirds (they're called Turnstones, I'd never seen them before) were staying well out of reach of the waves as they crashed onto the steps, rolling and foaming with a thunderous noise. The sea has so many faces, doesn't it? Calm and inviting some days, fierce and frightening on other days. I never get tired of watching it. Later on, we stopped for some lunch at a new harbourside cafe and sat outdoors in a sheltered spot. 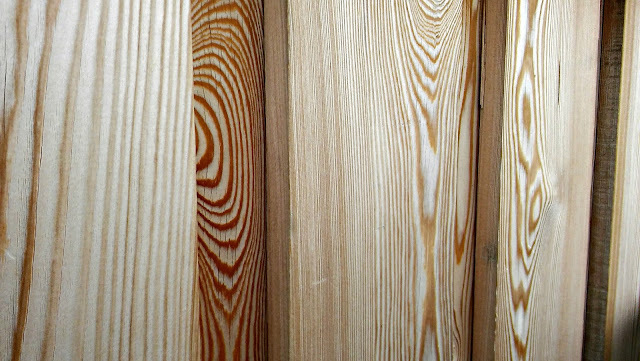 It doesn't take long for wood to weather, and the markings are just beautiful. How does nature know how to do that? It's very clever. Friday was Good Friday and we spent the day at home. The weather forecast for the weekend wasn't good and I managed to dodge the rain showers to take some photos of the garden. I had planned to get the grass cut and do some other jobs but every time I stood up to do it, it was raining or hailstoning and I was easily persuaded to stay indoors. and the grape hyacinths are out now too. 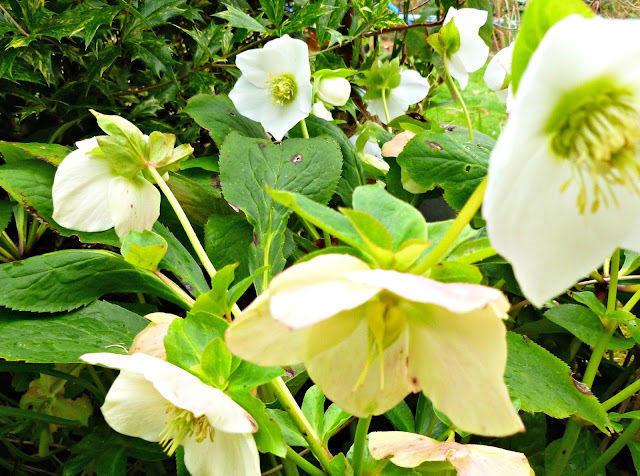 I love this Hellebore. 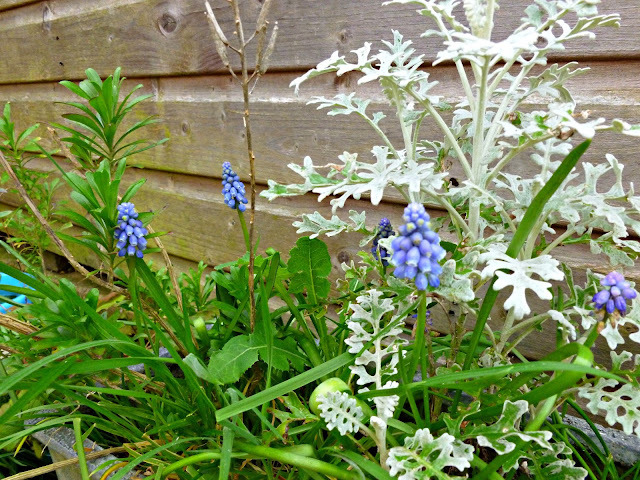 It grows by the front door and flowers every Easter without fail. 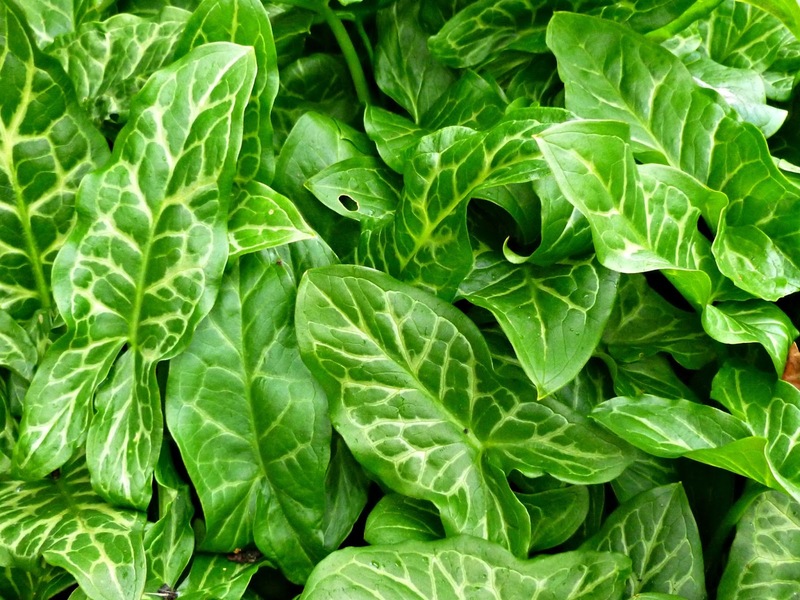 We inherited this plant - Arum maculatum, also known as lords and ladies or cuckoopint - with the garden and I don't like it very much but it's refused any and all efforts to get it out of the border. The autumn berries are poisonous which used to worry me, but the girls are old enough now not to be foraging for bright things to eat in the garden (luckily for me they never did, but you do have to be careful!) so I just cut off the seed heads as soon as I see them. I find them a bit creepy, to be honest; there's just something about them that makes me shudder (orchids have the same effect) but the leaves are quite interesting so I have learnt to live with them. 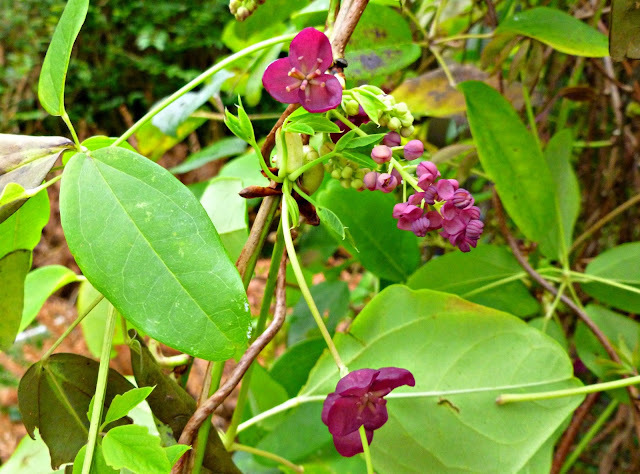 The first flowers of the chocolate vine (Akebia quinata) are out now and smell heavenly - it's just a shame that they're at the bottom of the garden and I have to remember to go and sniff at them! 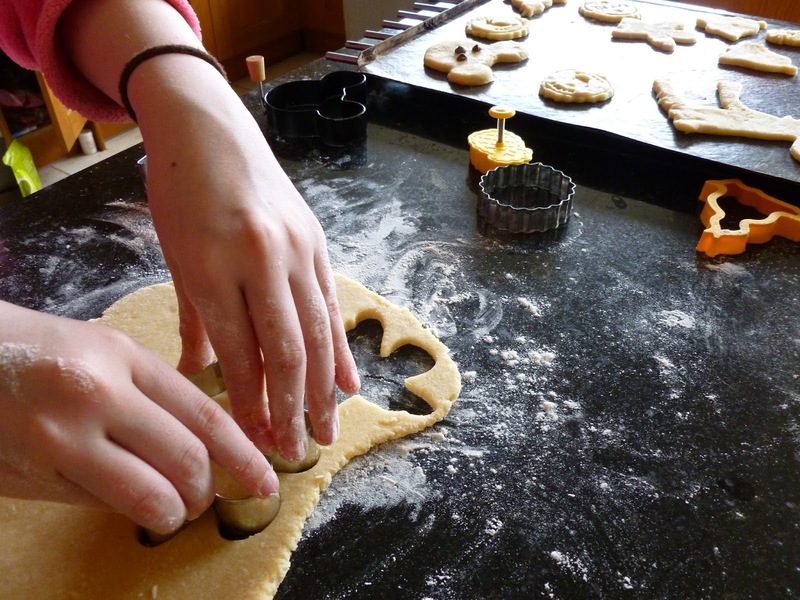 Small daughter and I spent most of Saturday afternoon baking. 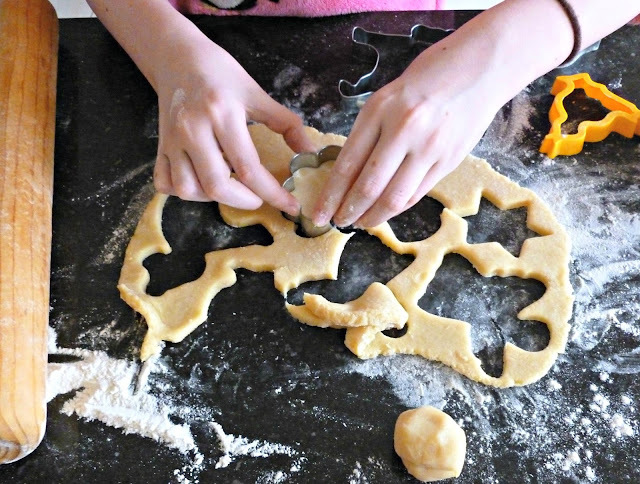 I asked her if she'd like to help me make the Easter Simnel cake that we make every year, and she agreed on condition that we could bake Easter biscuits too. It sounded like a reasonable deal to me, so we set to. 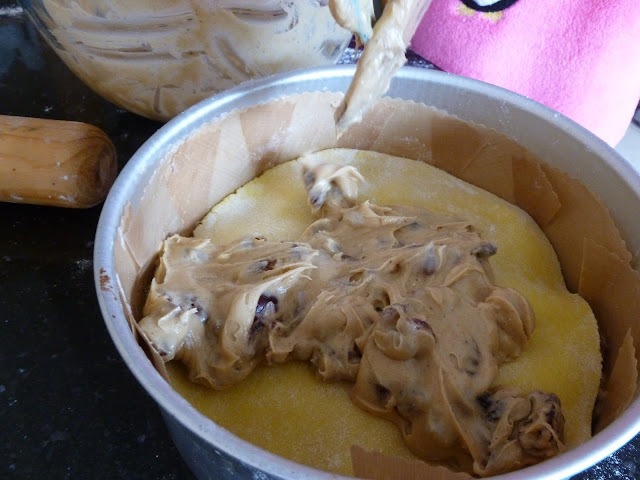 We started with the Simnel cake. 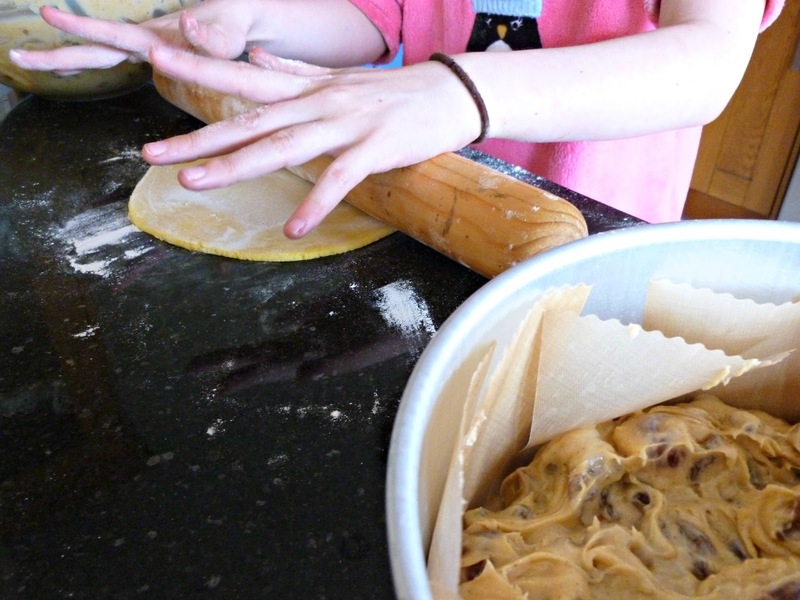 Small daughter isn't keen on fruit cake, with or without mixed spice, but she is very keen on marzipan so I had to keep a close eye on her as she was rolling it out to put in the middle of the cake as it was in danger of looking rather nibbled around the edges. I love the marzipan layer in the cake, it makes an ordinary fruit cake just a bit more special. 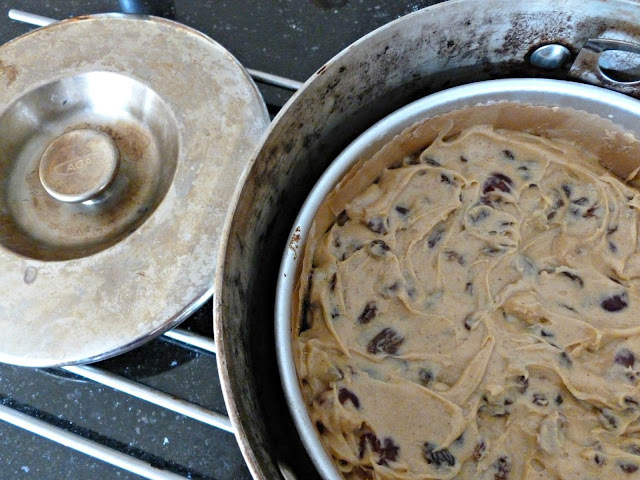 Fruit cakes are always cooked in the baking tin in the Aga to stop them cooking too quickly. It's a handy pot, useful for soups and stews as well as cakes! Next up were the biscuits. 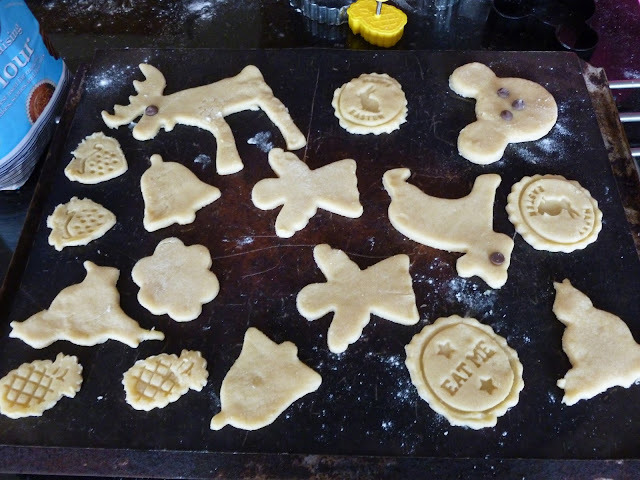 Nothing exciting, just a standard biscuit recipe that we've used for years which holds it's shape nicely when you cut the biscuits out with cutters. I was surplus to requirements when it came to the cutting out - small daughter likes to do that bit all by herself and we've collected a good many cutters over the years, so she wasn't short of choice. As it was Easter, she went for traditional Easter symbols - chicks, bells, angels ... Mickey Mouse, moose (mooses? ), strawberries, Olaf the snowman ... it would seem that our extensive range of cutters isn't that extensive when it comes to Easter shapes! 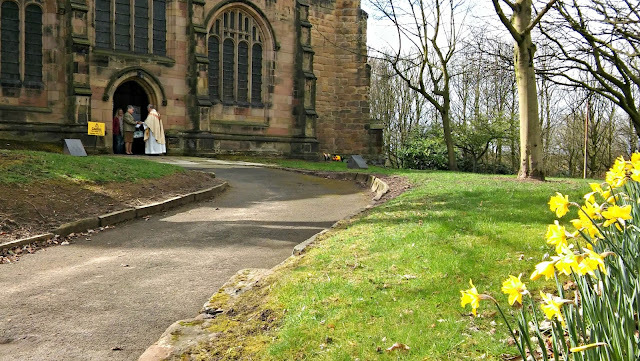 On Sunday morning we were nearly caught out by the clocks going forward for British Summertime but made it to church on time for the Easter service. I don't go to church every week, but when I do go I am struck by how lucky we are to have such a lovely old church to visit, and how peaceful it always seems when you're inside. Our church is very old - it's mentioned in the Domesday Book - and I always wonder about the changes that the church has seen over the years, the people of the village who have come and gone and those who will come in the future. I like that visitors to the services are always welcome, and those who go more regularly are just assumed to be part of the church community; there's no ceremony or jumping through hoops, but there is friendliness and a certain comfortable security. It's good. We had a lazy afternoon, snuggling together to watch a film and eat chocolate. In other parts of the country there were hurricane-strength storms but apart from one of the loudest claps of thunder and brightest flashes of lightning that we think we've ever seen (which very kindly knocked our broadband out), we got off quite lightly and were glad to stay indoors doing our own thing. 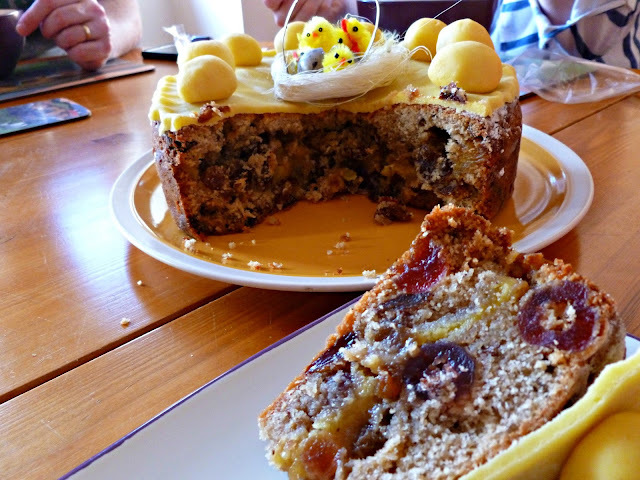 After dinner we ate our Simnel cake. Small daughter still wasn't keen on trying it but did offer to eat any "spare" marzipan that might be lying around. Funnily enough, there wasn't much. 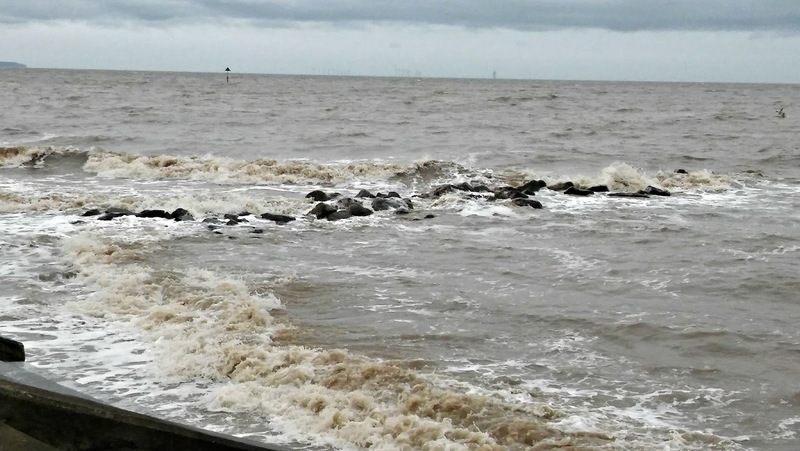 Today has been another strange weather day; heavy rain and strong winds followed by sunshine. When my husband and I were out on Thursday we saw lots of people setting up tents and caravans for the weekend, and I have been very glad that we were not one of them - I have spent the weekend hoping that they didn't get blown away! Tomorrow, everything will be back to normal (apart from having big daughter around this week) and the Easter break will be over. It always feels like time has passed too quickly, although I think that I will appreciate the rest more as the week goes on; it's been quite nice to have been cooped up as much as we have! I hope you have had a lovely weekend too! It looks like a perfect Easter weekend. That sea looks wild in your first photos, and we've had some heavy rain and high winds here over the weekend too, as well as sunshine. Your Simnel cake looks delicious and I love the assortment of biscuit shapes too. It sounds like a lovely family weekend. We managed to get two dry days over the weekend, the wet ones were pretty horrible and we had snow! It is lovely to spend extended time with family isn't it.